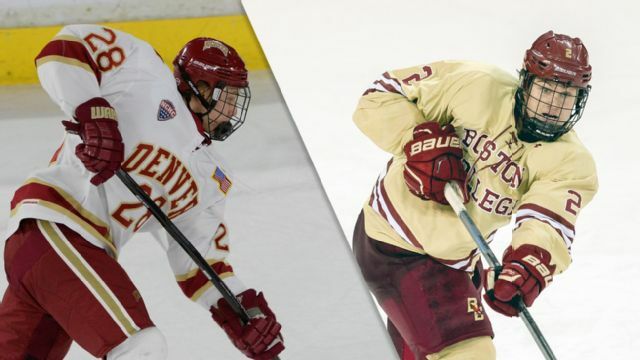 Denver at Boston College might be the biggest match-up of the young 2015-16 college hockey season. This game pits two teams that are still in the process of finding their identity against each other. As we've seen over the past few weeks, Denver is a team that is loaded with talent but struggles at times to play as a single, cohesive unit. Of course, in game 2 against Michigan State, things finally seemed to come together for the Pios as they put together their first "full 60 minutes" of the season. After a bye-week, it will be interesting to see whether DU comes out and builds on the momentum they built in that last game against the Spartans. On the other bench, the Eagles are in a similar place as the Pioneers. They dropped a close 2-1 game to Rensselaer (RPI) to open the season before beating a bad Wisconsin team 6-0 and sweeping CC at the World Arena in 3-0 and 5-0 decisions (surprise, surprise). To get a closer look into the way the season has progressed for BC, I talked via email with the managing editor of BCInterruption, Joseph Gravellese. Keep in mind that our conversation occurred just before the college hockey world was hit with the news that talented freshman forward Jeremy Bracco decided to leave BC to play in the OHL with the Kitchener Rangers. Nick Tremaroli: What are the differences and similarities between this year's BC team and the team that we saw in Providence in March? Joseph Gravellese: So much has changed that it feels like a different team. BC added four freshman forwards who are playing regularly. Jeremy Bracco, Colin White and Miles Wood are all high NHL draft picks who are expected to be big players for BC and have really delivered so far. Freshmen have accounted for nearly half of BC's points. Another freshman forward, JD Dudek, has been a very good fourth line player for BC; he's also an NHL draft pick. And then you've got a fifth freshman on the fourth line as well, Chris Brow, who's contributed as well. It's completely reinvented the offense; last year, BC was basically a one line team (Tuch, Sanford and Gilmour) and when they weren't scoring, the team wasn't scoring. So far through five games, three BC lines have all had their moments to put up big numbers. It's fun to watch. Also, Thatcher Demko just looks like an entirely different goaltender this year post hip surgery. He looks comfortable, confident, and very, very good. NT: Who are the key players that Denver fans should be looking for on BC's roster? JG: Miles Wood has probably been the most fun player to watch this season (#28). He's got blazing speed, a great shot, and he's strong. He loves to fly through the neutral zone and he goes hard to the net. Austin Cangelosi (#26) has been a key part of BC's depth this season. His offensive production dipped last year as a sophomore but he's off to a hot start this season with a beefed up line with Wood and Chris Calnan (#11). That's been BC's top line this year for the most part. Zach Sanford (#24) might be BC's best player right now, at least among the skaters; he's polished and very good around the net. NT: Replacing a player like Noah Hanifin is never an easy task for any team. What does the situation along the blue line look like this year? JG: Well, coming in to the season the defense was the biggest question mark for the team. BC didn't just lose Hanifin, they also lost Mike Matheson, who, though he had his critics at BC (myself included) logged a ton of minutes and is a first round draft pick. They had to replace them with unknowns; freshman Casey Fitzgerald and a rotation between freshman Josh Couturier and senior Travis Jeke, who's played limited minutes throughout his career. It's gone well so far, thanks in no small part to Thatcher Demko's elite goaltending (0.60 GAA through five games, the best defensive start in program history). However, the blue liners deserve credit too; no BC opponent has gotten 30 shots yet this season. Casey Fitzgerald in particular has been very good right out the chute as a freshman, and Scott Savage, a junior, is off to a very good start after an uneven first two years. NT: Jerry York is arguably (not really that arguable) the best coach in college hockey. He's built a powerhouse of a program in Boston. From a fan/journalist's point of view, how has he sustained such incredible success over the long-term? JG: There are many factors, but the #1 factor is his and the staff's repeated ability to attract quality players that have stayed at BC for 3 or even 4 years before going on to professional success. That's actually what's been troubling in the last few seasons, is that for the first time in a while, BC's been stung by departures to juniors, or Hanifin leaving after his freshman year. BC's had an incredible string of players - Gaudreau, Kreider, Atkinson, both Hayes brothers, Brian Dumoulin, Gerbe, Gibbons, the list goes on and on - who stayed for at least three seasons and built a foundation for the program without having to rebuild every year. BC's also had a number of excellent four year players who maybe weren't considered elite NHL prospects but were very good college players, some of whom have carved out pro careers for themselves - players like Ben Smith, Tommy Cross, Pat Brown and too many others to list. Basically, having good players. Is that a cop out answer? Ha. But York's vision for the type of attitude and commitment he wants his team to have toward the university and the program has attracted not just great players, but the right kinds of great players to succeed. NT: It's no secret that BC was also ranked very high to start the season, as they seem to be every year. Do you think those preseason and early-season accolades were/are justified? JG: Yes and no. BC has a highly talented roster if you just count up the draft picks, but that doesn't necessarily mean anything until you see how the team looks on the ice. Plenty of teams have churned out elite NHL talent year after year without necessarily raking in all the big hardware - Minnesota and Michigan being two of the more obvious examples. Given that BC was a tournament bubble team last year and lost their top defenseman in Noah Hanifin, I think expectations need to be kept somewhat in check. That said: 1) they look very good so far, and 2) there's really not that many teams out there that have clearly elite, dominant, veteran rosters. Nebraska-Omaha and Minnesota-Duluth are the only two teams I can think of who made really deep runs last year and return a vast majority of their top players. Everyone else has real question marks. It should make for a fun season. NT: Thatcher Demko is one of the best goalies in the country. I had the privilege of watching him in person last year and I was impressed. His last two games were against a very weak CC team, so do you think you might see a bit of a hangover from those easy games? JG: Gotta love throwing shade at the rivals. But yeah, they're pretty bad. Well, he's faced several meh teams in a row at this point... Wisconsin is pretty bad, Army is obviously not very good, RPI's only win came against BC... so you have to keep that in mind when evaluating his performance so far. The whole team is going to have to take it to the next level to compete with a team like Denver, but I think Demko is probably the least of my concerns. NT: If BC doesn't make a run to the Frozen Four this year, I'll be among the many surprised college hockey fans. That being said, what are some of the factors that might prevent this year's Eagles from making a run to Tampa? JG: We still don't know how this defense is going to hold up against top competition week in and week out in Hockey East play. You're still counting on two freshmen in Fitzgerald and Couturier to play big minutes, and Savage to keep up his excellent play that's very much outpacing his sophomore season. That's going to be the obvious answer until BC sustains their defensive strength against top teams. Health is always a factor too, and BC particularly on the blue line can't afford to sustain an injury; then you start dipping in to walk on territory. There's only one extra defenseman on the roster to begin with. Even up front, Brendan Silk is already out for a while with a separated shoulder, so BC would be skating a walk on if one more player got hurt. York rarely has a big roster with many players in suits and ties so it's always sort of a tightrope act. Also, if Demko has any health problems, then we're in big trouble. So fingers crossed on that front. The other factor would just be that hockey is crazy and honestly any team in the tournament this year is going to be able to beat any other team. That's a pretty cliche answer, but it's true, even more this year than usual. Last year at least had the BU team that was SO good that it would take a herculean effort to beat them, and PC delivered just that in the national final. I can't see anyone rising to that level this season. NT: BC-BU. Big rivalry. One of the biggest and best in college hockey. What does it mean to the city of Boston? JG: Well, I'm biased because I'm a BC fan, but it means a lot. Both schools are huge cultural institutions in the region with loyal followings. The nature of the rivalry also makes fans of the other local programs (Northeastern, UNH, the UMass campuses, Providence, etc.) hate us both even more for how much attention the BC/BU rivalry gets, which only serves to make league contests even more fun. It's unique to have a situation where two great programs are three miles apart from one another on the same road, located on the same train line. There are a lot of great rivalries in college hockey but no others with this kind of proximity. And to then have another 6 or 7 really good programs within an hour's drive just makes it even cooler. Boston is not a college sports town - a vast majority of the sports oxygen is sucked up by the four big pro teams - but the sheer amount of great college hockey around here means the roots for college hockey run a lot deeper than they do for college football or basketball. It makes it fun to be a hockey fan in the area, that's for sure. I want to thank Joseph again for coming up with the idea to do a Q&A with each other about BC and DU. You can read the Q&A with reversed roles right here. There is a really good chance that DU and BC will meet for the third year in a row in the NCAA Tournament. I think I can speak for all DU and BC fans when I say that I hope it happens in the Frozen Four this time instead of during the regional round. This game against the Eagles will be Denver's biggest test of this young season. How they respond to the pressure and the talent of playing against a team like BC will go a long way in helping us predict how the rest of this season will go. Both of these teams likely had this game circled on their calendars since the schedule game out over the summer. They're ready for the puck to drop. Excellent and insightful interview with a very knowledgeable BC blogger. BC under Jerry York is the gold standard program in the last 20 years of college hockey. Always an honor for DU to play them. I went down to watch last Saturday's BC game. They are a bigger team than year's past. They have the typical Jerry York disciplined style. Strong PP and kill with excellent puck management. I agree with BC interruption that Demko looks the best he ever has and they have more depth. BC's D is much more conservative. They focus on defense--no offensive rushes like the Pios. The two teams play a very similar style offensively. I give the edge to BC--mainly due to their discipline. I think special teams will be the key. DU's PP has been flat. I don't think their still forming PP will not be effective against the Eagles strong kill. I feel like Evan has been stronger in goal. I wonder if he gets the start Friday? Huge non-conference road game for DU! I expect they'll beat BU with not much struggle Saturday. BU lost Tuesday to UConn and plays again Friday. I think the Terriers will be in the middle of the pack this year. Nice job Pi-holes.....quit screwing over your fellow nchc teams by losing non-conference games!! Pios played well tonight against an excellent opponent. No shame in losing a heavyweight game like that in the last 30 seconds. Let's bring home the mail tomorrow! Disappointing weekend. I didn't listen to or watch the games. Sounds like we gave both bean eaters all they could handle, but we couldn't close the deal. I felt like this could have been a huge momentum gathering weekend, but I see we are back in neutral for the time being. Go get em' next weekend! I watched both games. DU had enough speed, skill, conditioning and chemistry to come away with a pair of wins this weekend, but instead, came away with nothing. Giving up late winning goals in both games is the mark of a young team that has not yet learned to close the deal on the road against good teams, coupled with some substandard goaltending. DU should be quite agitated this weekend against CC. Gotta keep calm and blow their doors off. Go DU!